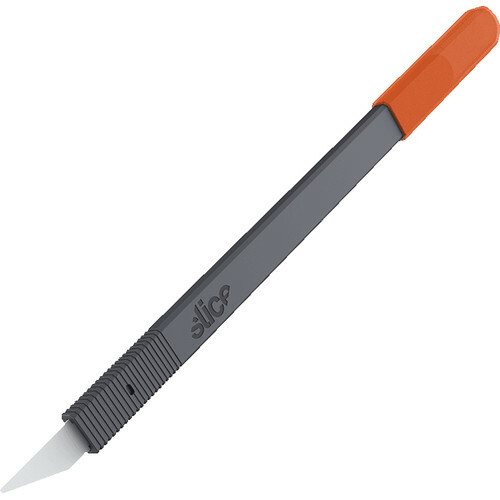 For precision and maneuverability, use the 10568 Ceramic Scalpel from Slice The installed rounded tip, zirconium oxide ceramic blade has a finger-friendly edge that is sharp for materials, but is resistant to cutting skin. The blade can cut into material 1/2" deep, is replaceable and compatible with the 10518 and 10519 blades. The scalpel is lightly weighted for balance and stability while the blade is non-conductive, non-magnetic, non-sparking, and chemically inert, so it will never rust. Additionally, the blade can be cleaned in an autoclave and used in extreme temperatures of up to 1600°. Box Dimensions (LxWxH) 7.65 x 3.35 x 0.2"